WHY IS FORCESHIELD SO STRONG AND SECURE? To provide you with the best possible security for your home and family, Forceshield has the strongest extruded profile & tracks available in Australia. In fact Forceshield shutters comply with Australian Standards to resist Category 3 cyclones. The strength of the Forceshield profile allows much stronger ventilation holes while still providing maximum security and strength. 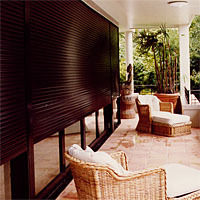 In the ventilated position Forceshield shutters provide a massive 7 times more light and air than conventional shutters. Manufactured in Australia from 6060T5 marine grade aluminium, the slat is punched through the top opening hook in a mesh pattern giving the large light and ventilation holes. Painted in DULUX architectural grade powdercoat giving maximum protection. Winter Forceshield Shutters keep the cold out and the warmth in by stopping up to 70% heat loss through the glass in winter. Save Money Forceshield Shutters reduce the cost of heating and cooling your home. Noise With a STC rating of 39, noise is reduced by up to 50%. Forceshield Shutters allow you to control the noise from the traffic, aircraft, noisy neighbours, barking dogs, lawnmowers, etc. Peace of Mind Forceshield Shutters form a shield to protect you against undesirable elements, yet they are easy to open for a safe exit. Bushfires Intense heat causes windows to explode & the curtains to burst into flames. With Forceshield Shutters this cannot happen because the heat gain through the glass is reduced by 90%. Versatile Use forceshield Shutters on all openings such as windows, doors, verandahs, counter tops, in both residential and commercial situations. Attractive Finish Forceshield Shutters come in a high gloss, super smooth, maintenance free, DULUX powdercoated finish in a full range of colours. The extruded aluminium 31mm profile is ideally suited to both commercial and domestic applications such as schools, hospitals, office blocks, residential houses. It provides the highest security protection against break ins. Forceshield gives seven time more light and ventilation than the standard European style 40m profile as well as being many times stronger.